Hi Everyone! Here is a card that I created with one of the FREE files that SVG Cutting Files offers! 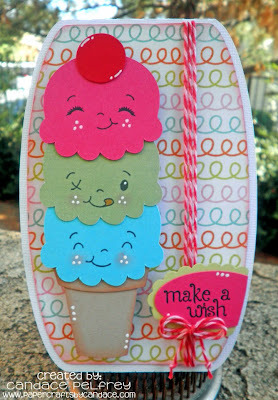 The Ice Cream cone is from Scoops of Fun! Isn't it so cute! I love it! The sentiment is from Jaded Blossom's "Make a Wish"
Twine is from Trendy Twine "Valentine Cherry Cupcake"
Faces are from Peachy Keen "Princess Faces" and "Boy Mates"
I also used a stampin up punch and my white gel pen. Happy Tuesday! Today is my day over at SVG Cutting Files Blog!! Isnt she the cutest? I LOVE her!! 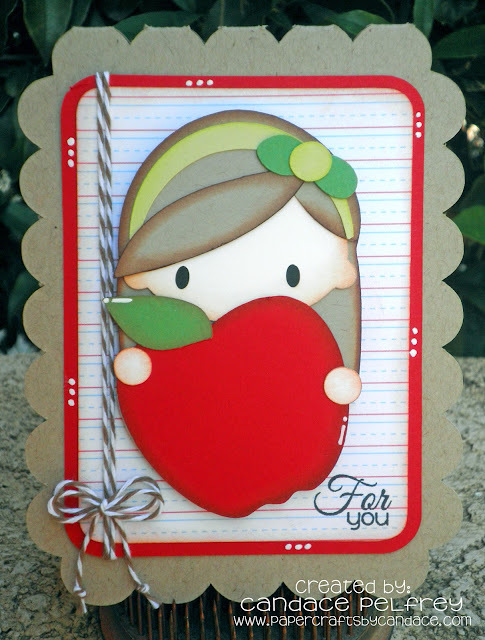 I also used Silhouette Store to create this shape card that she is on. 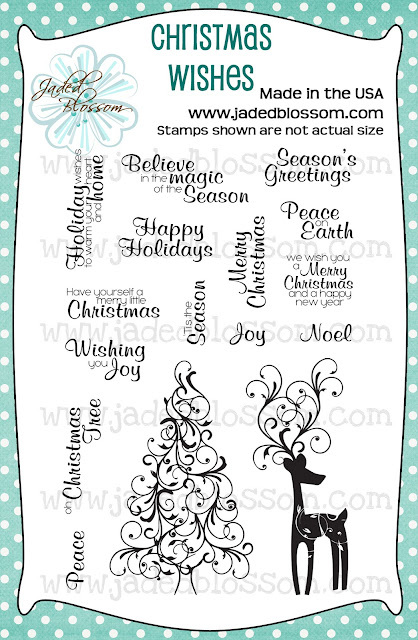 "For you" is from Jaded Blossoms "Simple Sayings"
Make sure to go to SVG Cutting Files blog and let them know I sent you BECAUSE there is another giveaway for followers and commentors!! Hi Everyone! Happy Monday! 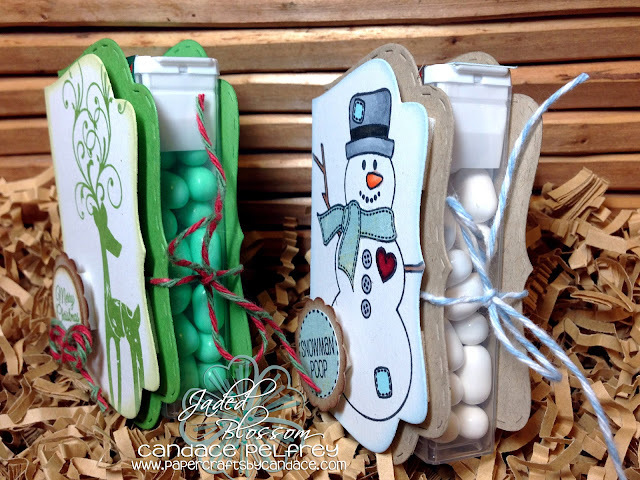 Today I am sharing some M&M sticks that I made for the craft fair that I had at work on Friday. 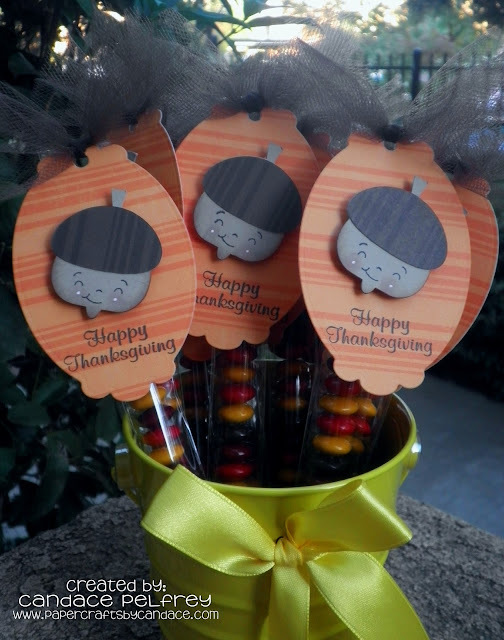 These Thanksgiving treats will also be given to my family and friends on Thanksgiving. The cute little acorn is from SVG Cutting Files. Its called Nutty Acorn! 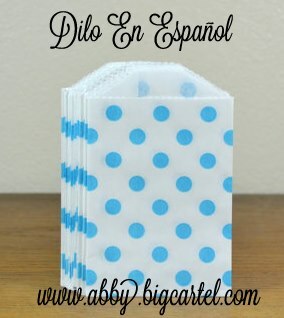 These bags are the 1x8 inch stick bags also from Jaded Blossom. Inside them are M&M's (the autumn mix). And you guessed it.. the face is from Peachy Keen!! I punched a hole in the tag and the bags and tied them with brown tulle. The orange and brown paper is Echo Park "Dots and Stripes". PLEASE go over to the SVG Cutting Files blog and become a follower. There is a PRIZE up for grabs!! Thanks so much for checking out my acorn sticks! Hi Everyone! If you have arrived from Michelle's blog then you are in the right place. If not and you would like to start at the beginning then please click here. WELCOME to the next stop on Jamie's Secret Baby Layout Hop!! 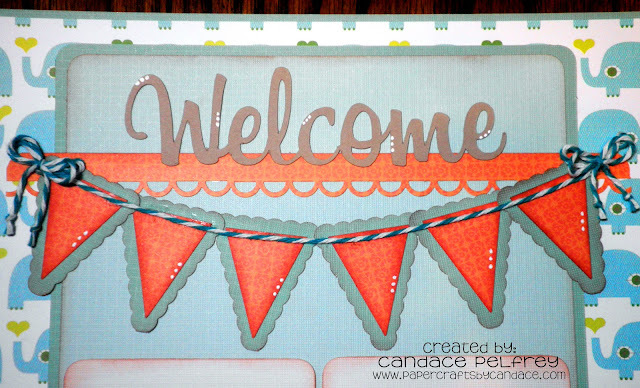 For the banner I used a stampin up pennant punch. The Welcome and Elephant are both cut from the Silhouette Store. 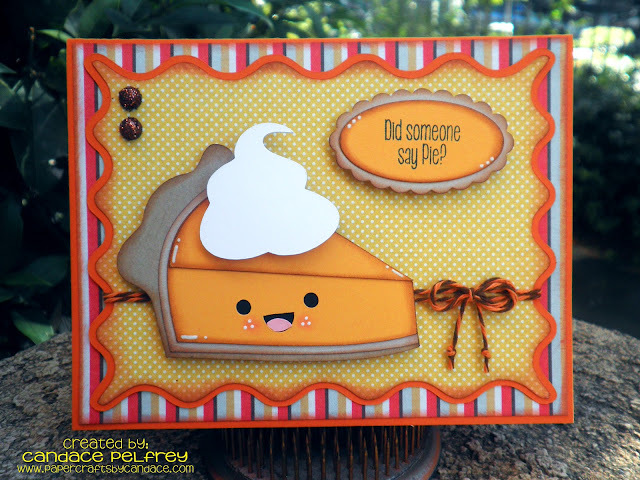 The orange piece behind the journaling area is Jaded Blossom's Fancy Topper Die. 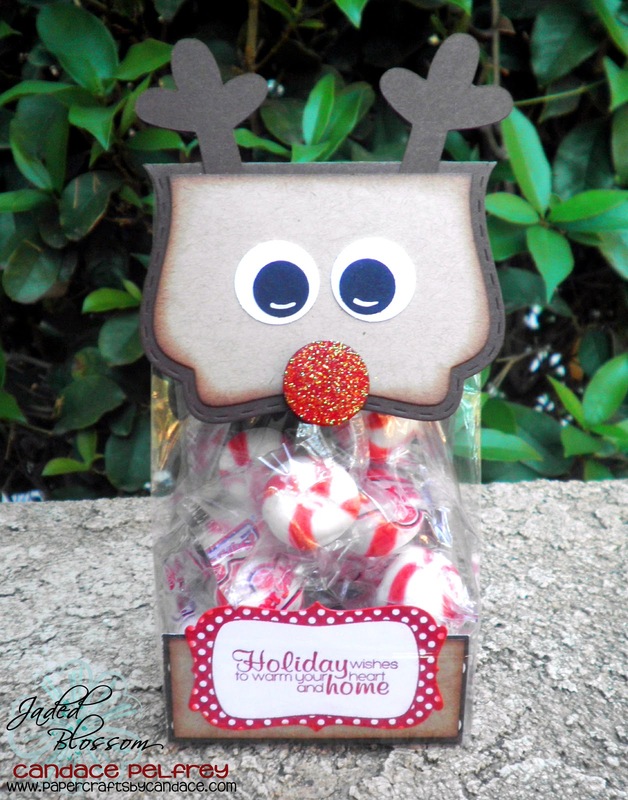 A close up of the welcome..
And what is a blog hop without some candy?!? To be eligible to win, comment on all blogs and like the sponsors on facebook. They are.. Thanks so much for checking out the hop! Next up on the hop is ABBY! Here is the entire order in case you get lost.. Happy Hump Day!! Another card to share with you today! And just in case you didnt see the past couple days posts, I am now a designer for SVG Cutting Files!! I love all these cute images!! Check them out here! Yesterday was Boss's day so this is the card that I made for my boss.. I used a FREEBIE file from SVG Cutting Files! Yup FREE! Check them out here.. there are tons!! The sentiment is from Jaded Blossom's "Winter Wishes". This cute ladybug is also on a wobble!! 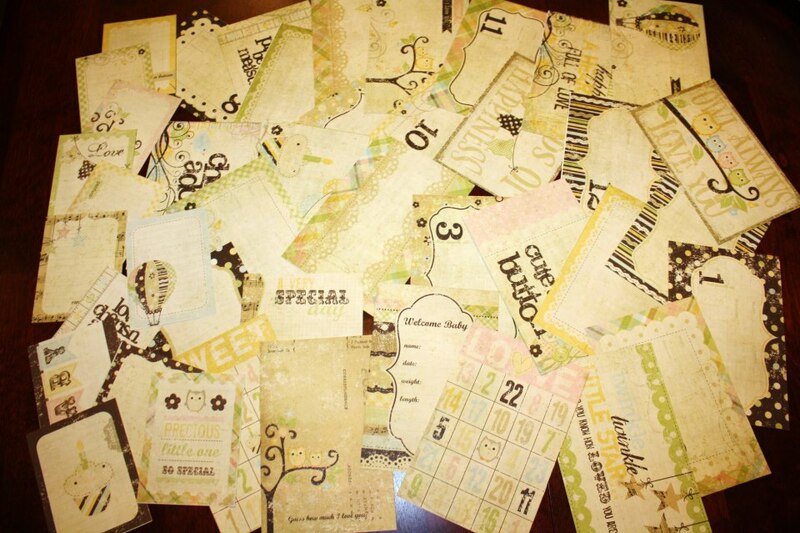 I get all my wobbles directly from The Scrapbook Queen! 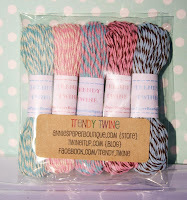 The twine is from Trendy Twine "Cherry Cupcake" All paper is from Echo Park and the cardstock is from Papertrey Ink. Please make sure to go and follow the SVG Cutting Files blog and like SVG Cutting Files on Facebook and let her know I sent you! Happy Tuesday!! Another card to share with you today! And just in case you didnt see yesterdays post, I am now a designer for SVG Cutting Files!! The twine is from Trendy Twine "Gray Licorice" All paper is from Echo Park and the cardstock is from Papertrey Ink. Make sure to come back tomorrow because I have ANOTHER SVG Cutting Files card for you!! Yes three days in a row! Happy Monday!! 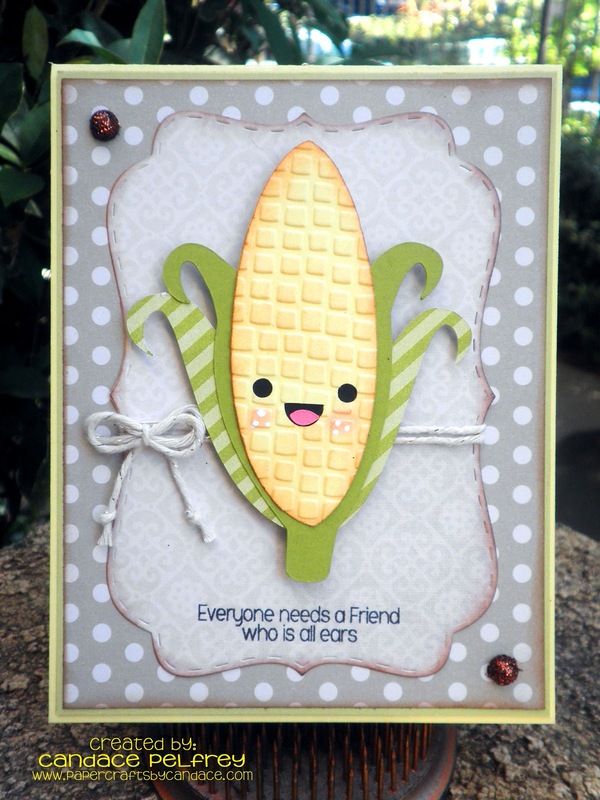 I am soooo excited to share with you todays card. But first.. a little bit of news that I haven't announced yet. I am now a designer for SVG Cutting Files!! So excited! I love all these cute images!! Check them out here! I used the "Im All Ears" file for my card today. Make sure to come back tomorrow because I have ANOTHER SVG Cutting Files card for you!! Yay! Hello! And welcome to the Trick or Treat blog hop! If you came from Jamie's blog then you are in the right place. If not and you would like to start at the beginning then please click here to go to Ashleys blog. I am sooo excited to share my project with you! 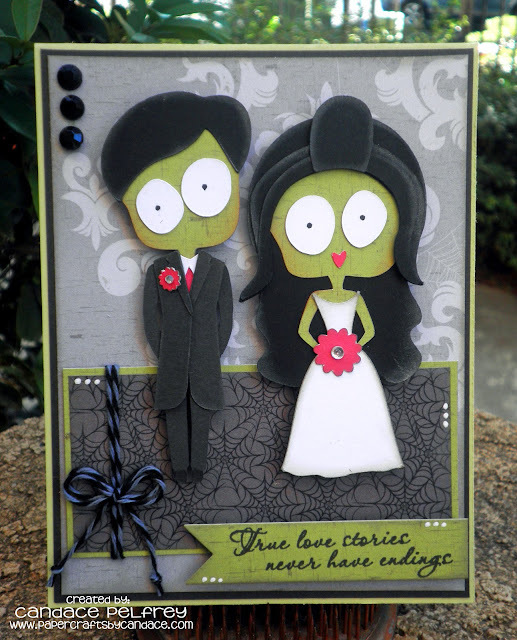 I used the new Fancy Topper Die from Jaded Blossom!! LOVE this die! Seriously!! And of course it is attached to the new Gusset Bags that are being carried by Jaded Blossom as well. I turned it into an owl! Sooo easy!!! 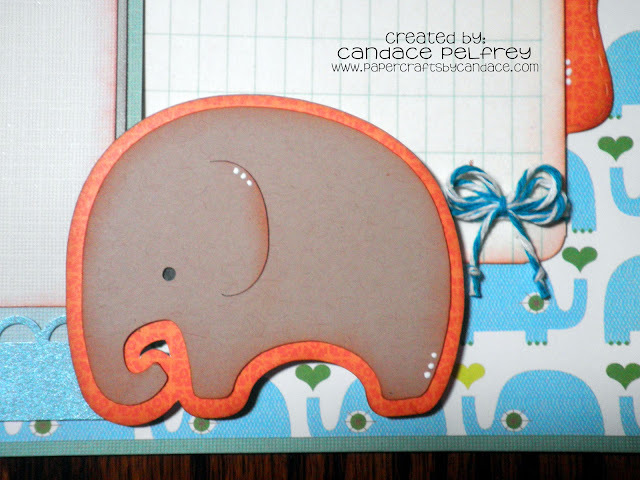 The nose was cut from a square piece of paper and then I used one of my circle stamps and punched out the corner. The bow is Trendy Twine's Thanksgiving Truffle. I am also submitting this to their Monthly Challenge "Too Cute to Spook"
Inside the gussett bag is a insert that I made by cutting a piece of paper at 3 inches wide by 9 inches long and then scoring at 1 1/4 and 3 1/4 and then decorating the front piece. 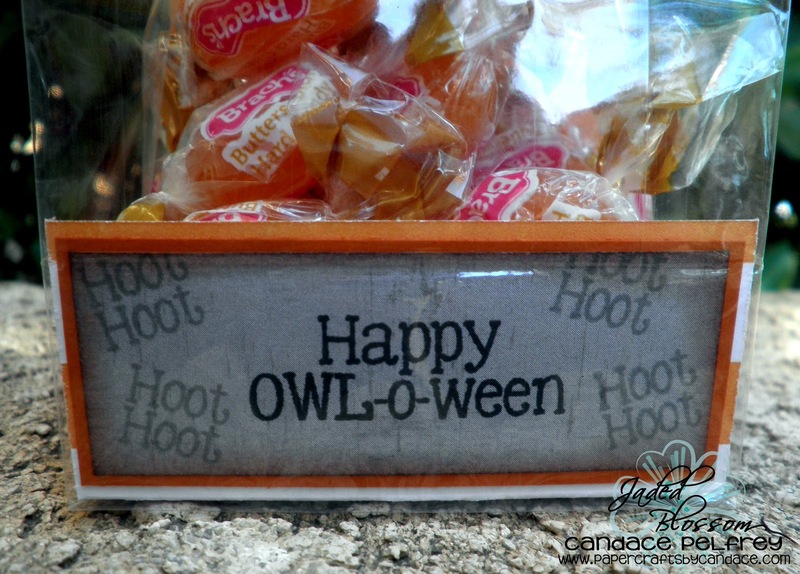 The stamp sentiment Happy OWL-O-ween and hoot hoot are both from Happy Owl-o-ween. Inside the bag are butterscotch discs. Did you see the sponsors for this hop? 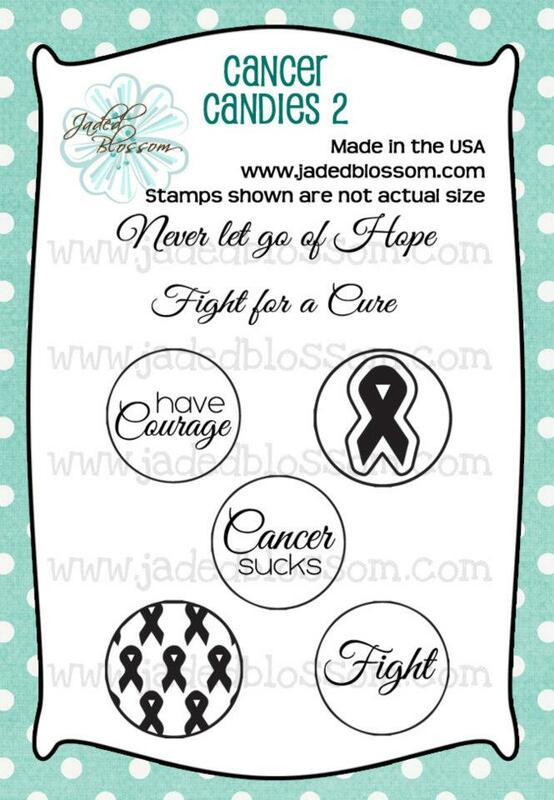 Jaded Blossom is actually giving away the stamp set I used for this project!!! 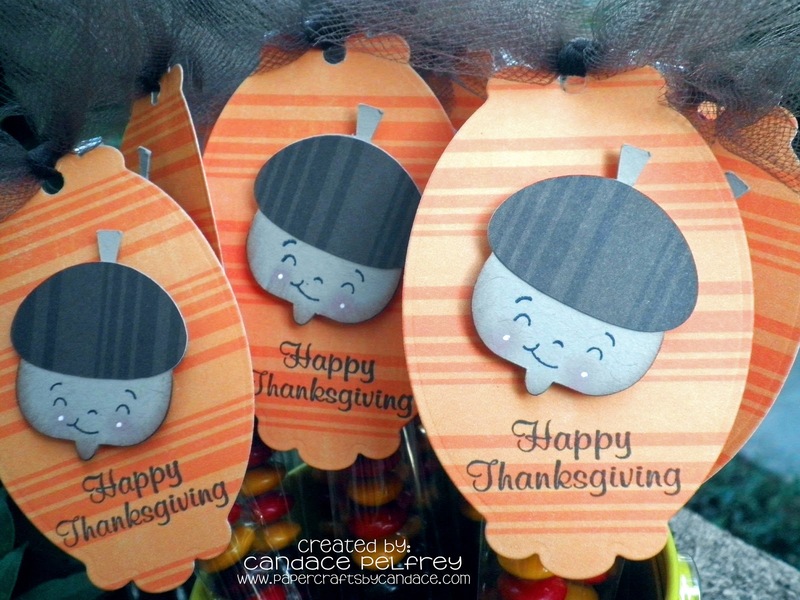 Thanks so much for hopping along on the Trick or Treat blog hop! Next up on the hop is AMANDA! Hi Everyone! Welcome to Jaded Blossom's October Release Blog Hop. I just love this Release!! Now if your here from Jaded Blossom then your in the right place, if your just passing thru start at the beginning because you don't wanna miss anything!! I also have the complete line up at the bottom. And here is my project!! Tic Tac Wraps!! 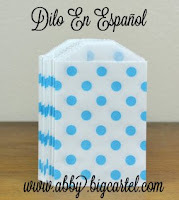 These are perfect for craft fairs, co workers, stocking stuffers etc!! I used the Fancy Topper Die for the wrap, Winter Wishes and Winter Candies for the snowman and Christmas Wishes and Christmas Candies for the reindeer one. 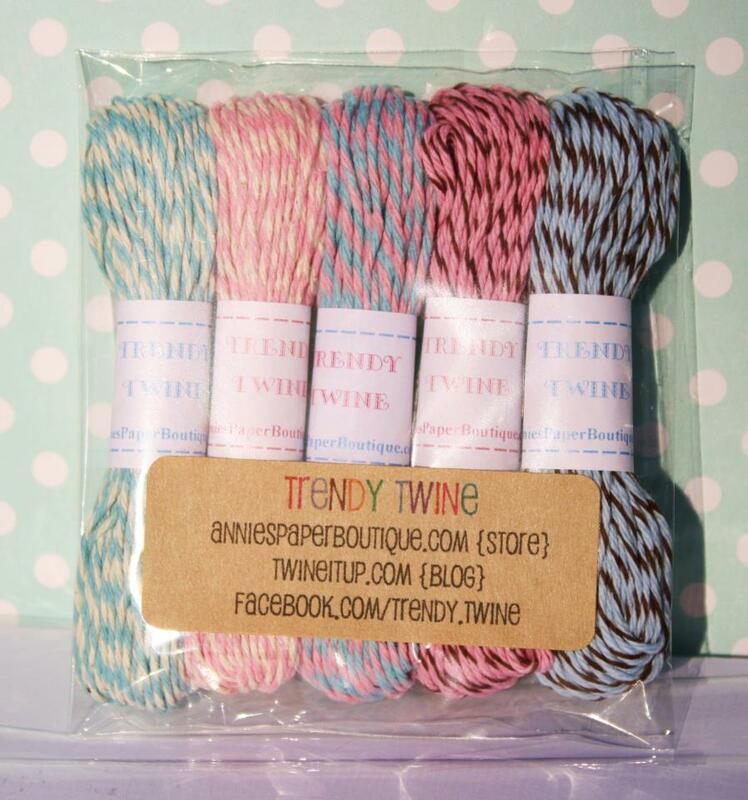 I also dressed it up with trendy twine! Now I know your dying to know how to make these right? Good news, I have a tutorial for you!! Step 1: Cut out your fancy topper die and insert. Step 2: Score! I lined the middle of my topper die on the 5 on my score board and scored just under 1/2 an inch on both sides. Step 3: Trim your insert. I lined my insert up along the lines on my paper cutter and trimmed off 1/4th an inch. Step 4: Decorate your insert! 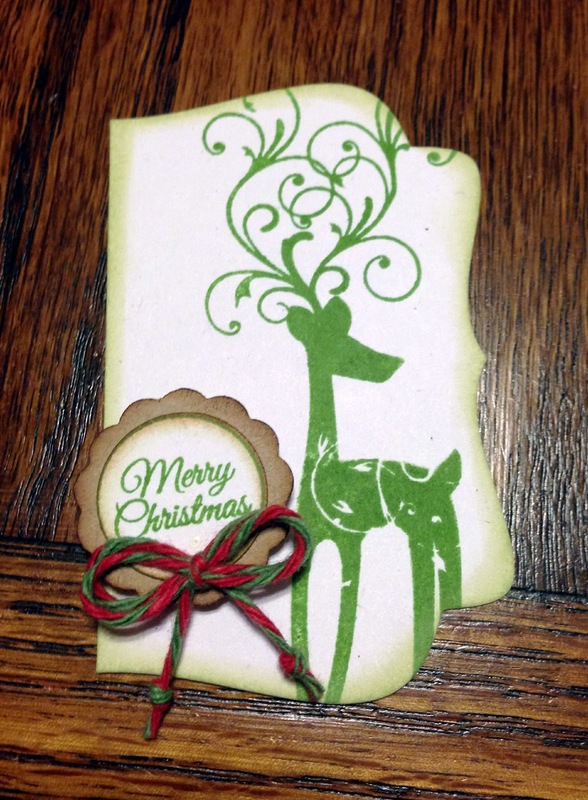 I stamped the deer from Christmas Wishes. I also stamped the circle from Christmas Candies and I punched it out with a 3/4 inch circle punch. I also punched out a 1 inch scallop circle, did some inking and added some Trendy Twine! Step 6: Add pop dots to the back of your decorated piece. Make sure to leave room in the middle for twine or ribbon. Your going to end up tying that in a bow to keep it closed. 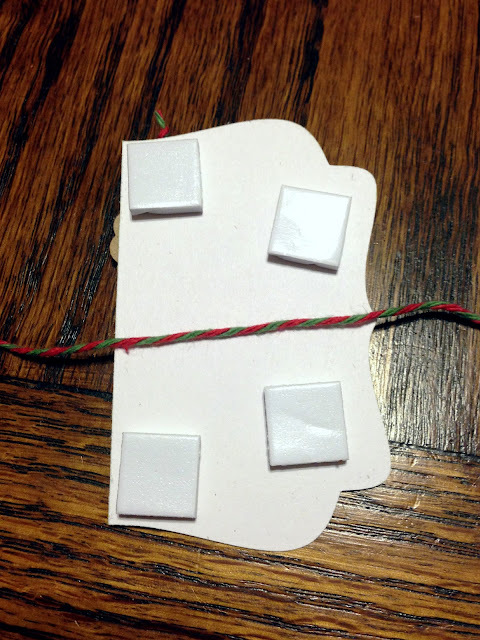 Step 7: Remove pop dots, add it to the front of your tic tac wrap and tie the twine in a bow! And then you are all done!! Here is another view.. 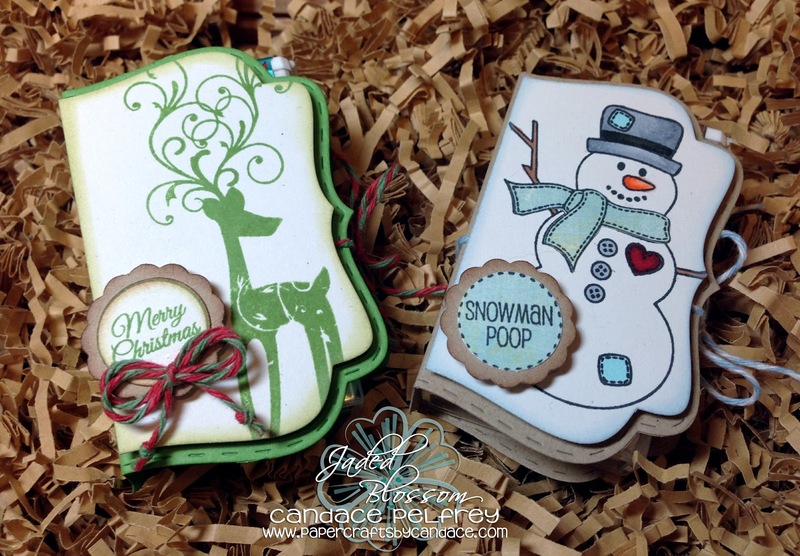 This fancy topper die made these SOOOOOO easy to make! I LOVE this die!!! So what do you think? And of course we have to have a deal for you right? This weekend only you can get the entire release package for $119.99 FREE SHIPPING (only to those that order's the Entire Release. - that's at least over $10+ in savings! 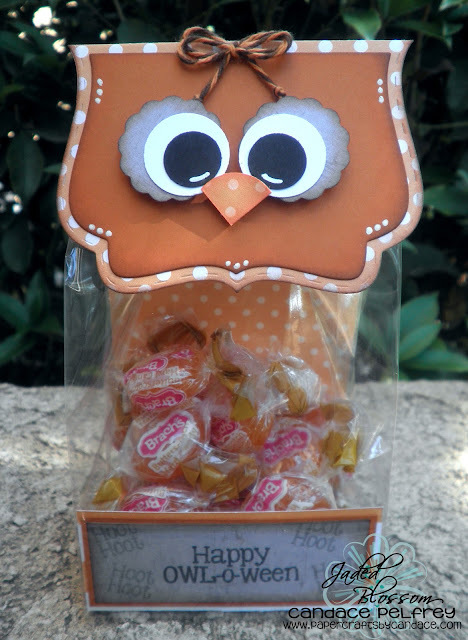 What is a blog hop without some blog candy? 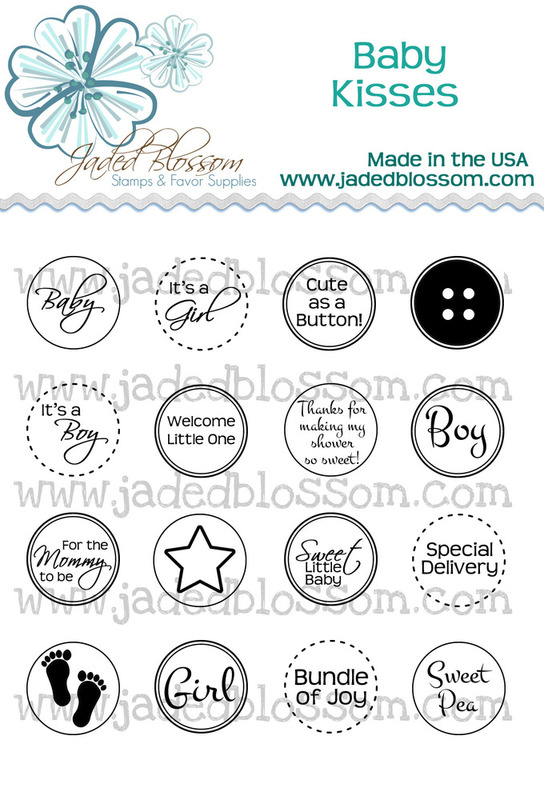 This month Jaded Blossom is giving away a $15 Gift Certificate to Jaded Blossom Store. The more blogs you comment on the more chances you have to win! 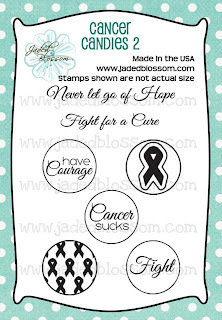 Cancer Candies 2 Stamp Set for Free!!! Here is also an extra Goody that you will received just for ordering some Jaded Blossom Products for this Weekend (along with tutorial!). Thanks so much for checking out my project and the Jaded Blossom Hop! 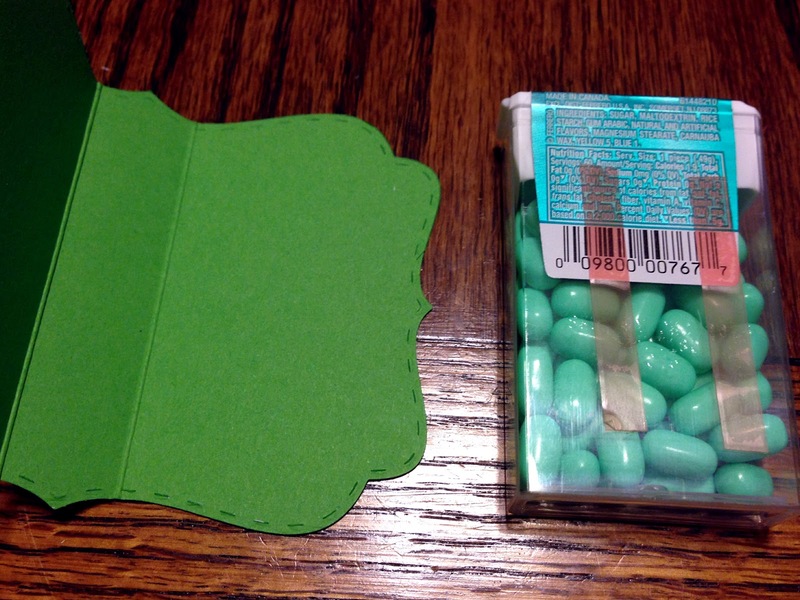 I hope to see your tic tac wraps very soon! 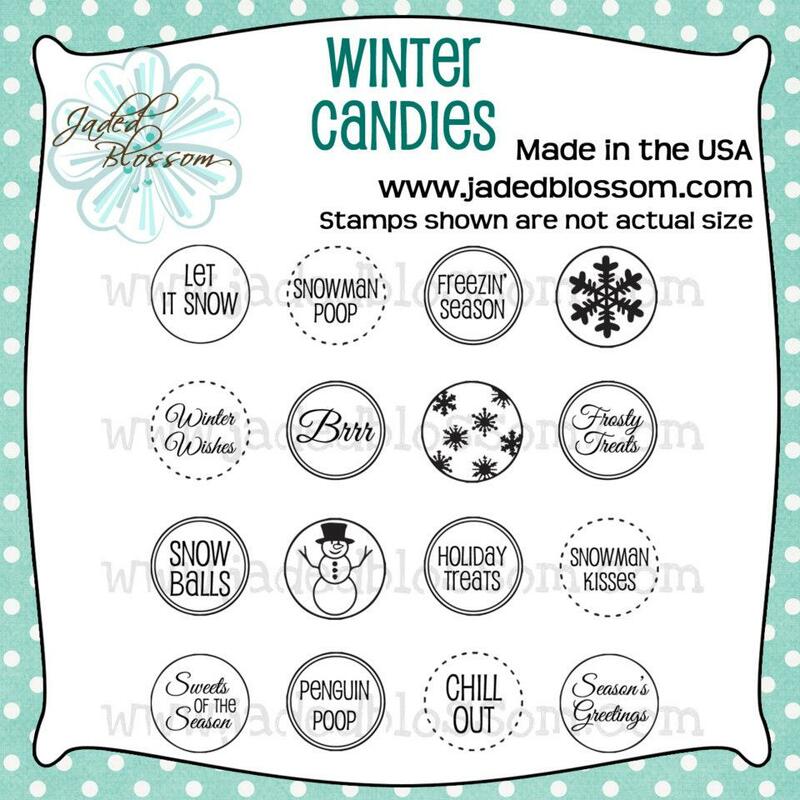 As most of you know, Jaded Blossom likes to do giveaways with stamp releases! 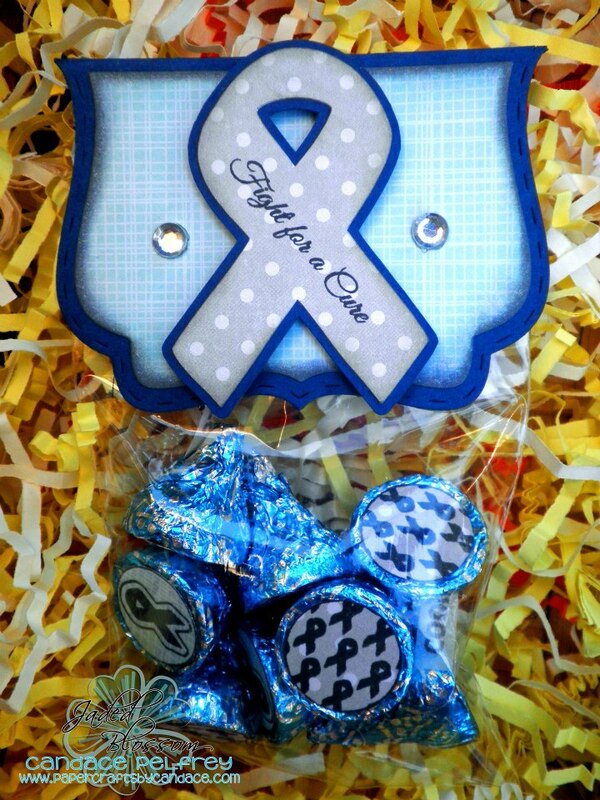 And a couple months ago we gave away Cancer Candies and got a HUGE response over them. So they are back with a twist! These will NOT be in the store for purchase. Michelle and I believe we should not benefit on others misfortunes so therefore we are doing a giveaway with these. Anyone to order more than $35 on release weekend (Friday through Sunday) will get these for free! We have PLENTY of these for anyone! So as long as you get your $35+ order in by Sunday at midnight you will get one! Here is what I created with them. I used the new Jaded Blossom Fancy Topper! Sooo easy. Some of you may know, my nephew was diagnosed with Type 1 Diabetes last November. 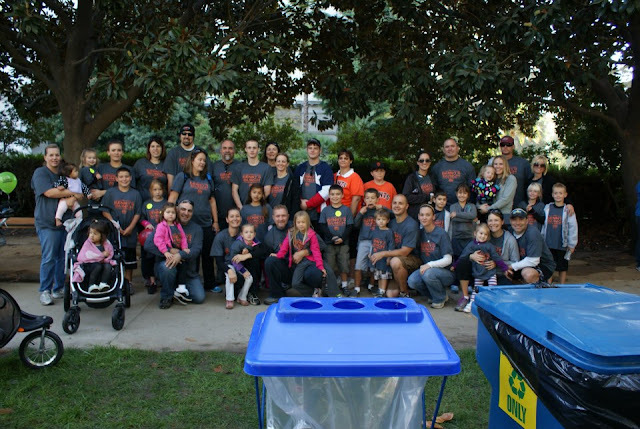 This year we did the JDRF walk at the capital. My Sister in law, Mother in law and I created these to give to all the walkers. And here is a picture of all us walkers. 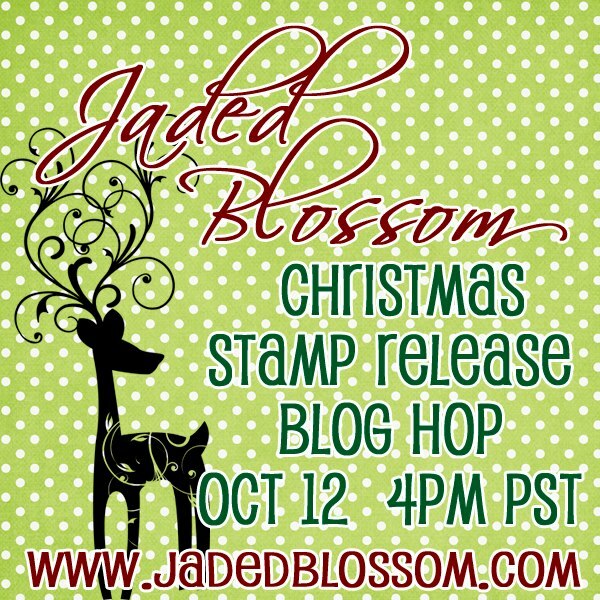 ake sure to come back at 4pm PST for the Jaded Blossom Stamp Release hop!! Hi Everyone! 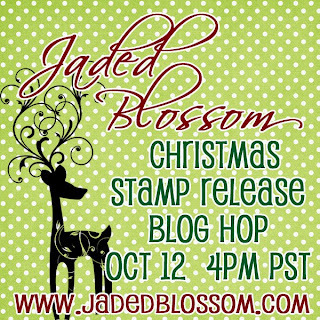 Welcome to day 4 of the Jaded Blossom stamp release week!! Today the last two stamp sets are being revealed! Now for my project, I created this cute hershey bar slider and then added one of the candy stamps to his scarf! 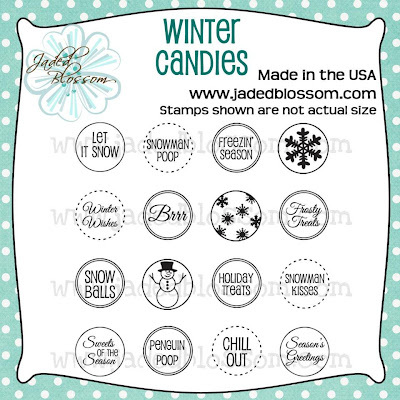 I wanted to show you that you can do more with the candy stamps then just putting them on candy. 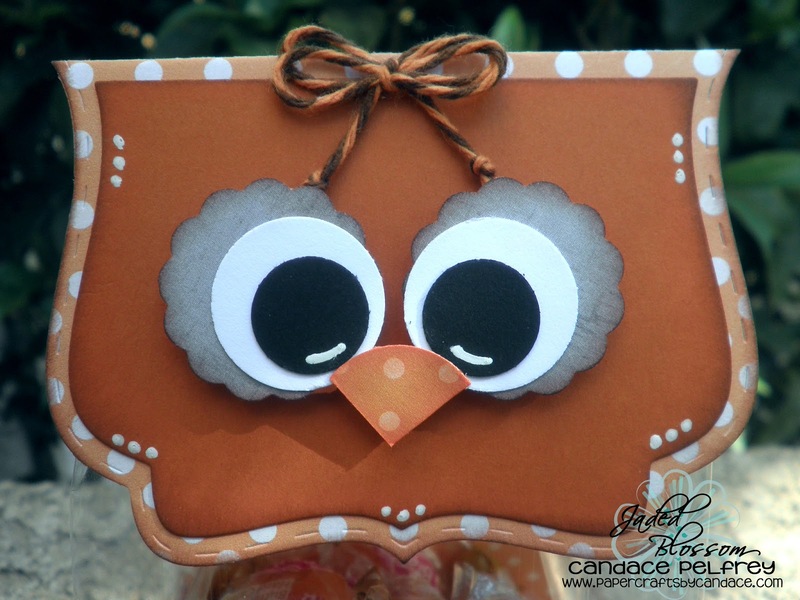 This cute little tag is the perfect accent and size for my hershey bar slider. I used a 3/4 inch circle punch to punch it out and then used a 1 inch scallop circle punch to layer it with. I accented the tag with red twine and hemp twine. Make sure to check out the rest of the projects over at Jaded Blossom!! 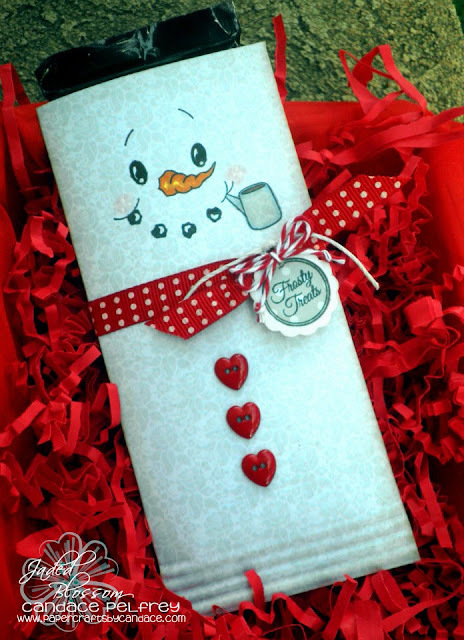 And don't forget to come back tomorrow for a surprise and the blog hop at 4 pm PST! 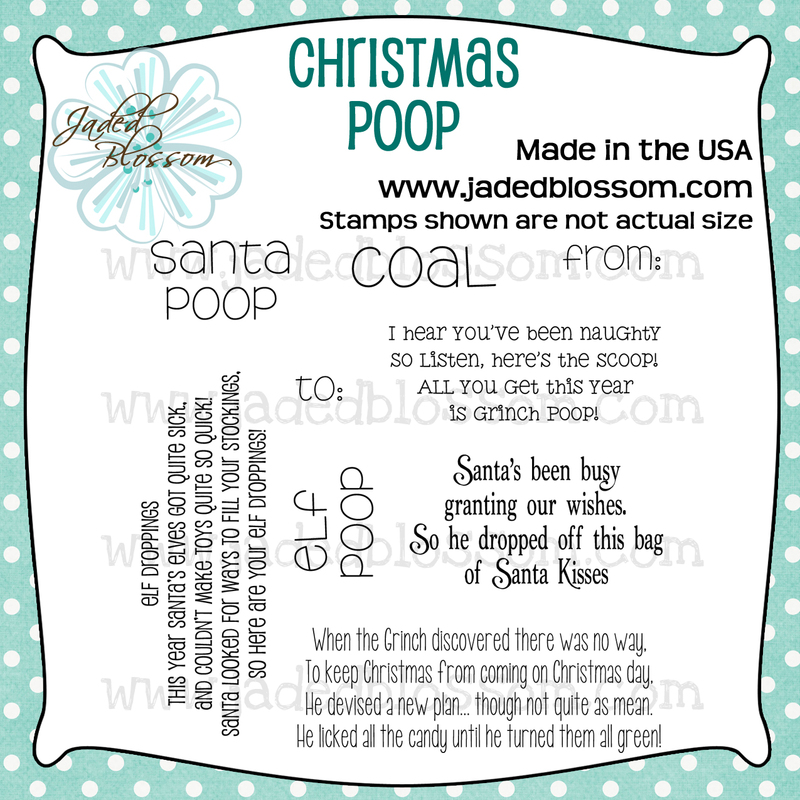 I am sooooooooo excited to share todays stamps and my project that I created!! So without any waiting.. todays stamp set is Christmas Wishes!! I just LOVE the reindeer and the christmas tree!! Now on to my project.. I used the new Fancy Topper Die for the reindeer head. The eyes are a 3/4 inch and 1/2 inch circle punch. The nose is also a 3/4 inch circle. The antlers are cut from Silhouette studio. The bag is Jaded Blossoms new Gusset Bags. The sentiment is stamped on the curly label die released in August and I used everyday borders for the border around the sentiment. Thanks so much for checking out my project today! 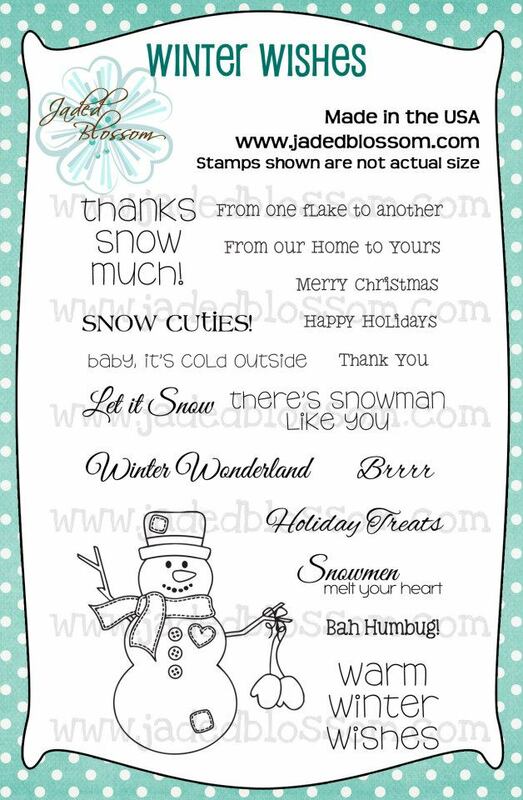 Make sure to check out the rest of the design team projects over at Jaded Blossom!! Hi Everyone! 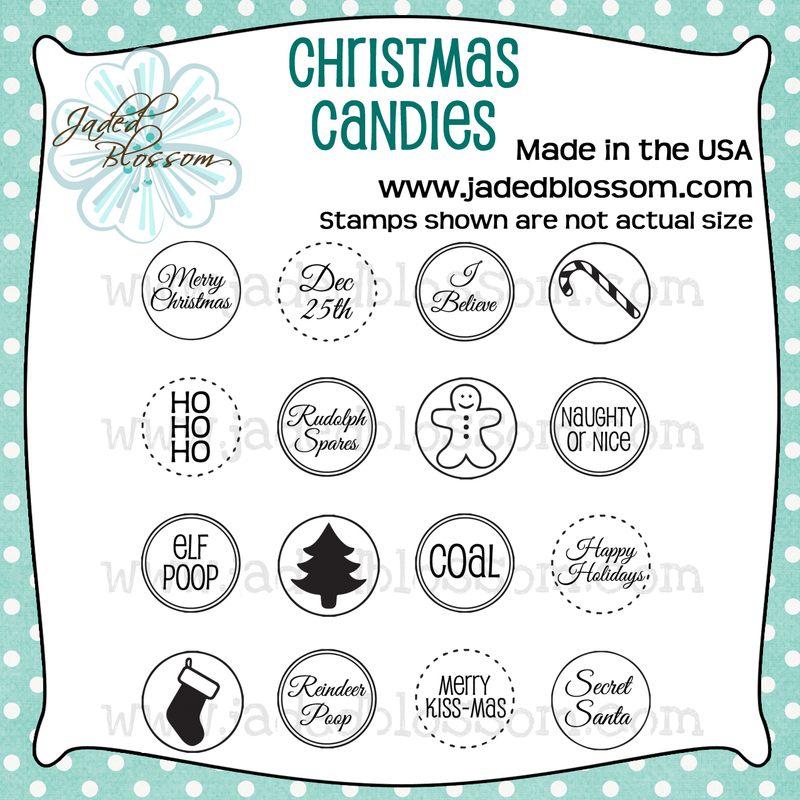 And welcome to day 2 of Jaded Blossom stamp release week! So excited for todays two stamp sets! So of course I had to combine the two WITH the new fancy topper die to create this!! Isn't this fabulous? Who wouldn't want this treat! I also used the curly label die that we released in August. 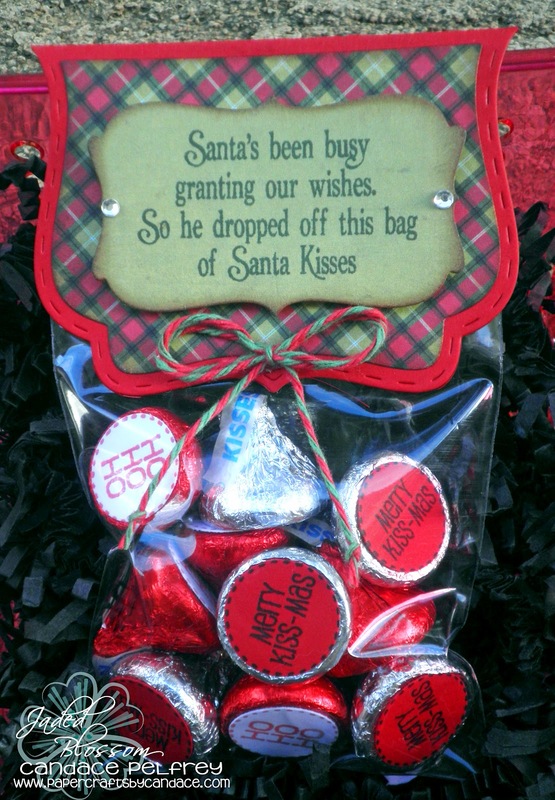 So for the bottom of the hershey kisses I used Christmas Candies. 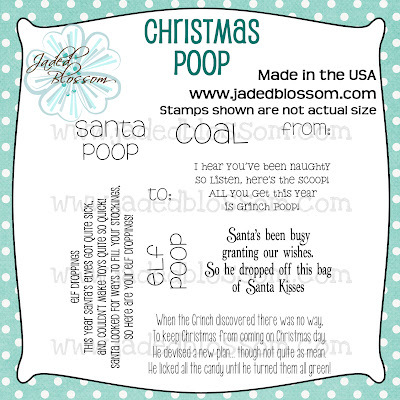 And the poem is from Christmas Poop. The paper is Echo Park and the twine is from Trendy Twine. Thanks so much for checking out my project today! Make sure to head over to Jaded Blossom to see the rest of the design teams creations.